This is another great post from PhD student, full time gallery worker and mother, Evelyn Tsitsas … who decided a while back to do 3 conference papers just 8 months out from submission. She is now questioning the wisdom of her decision! It seemed like a good idea at the time. Somewhere, among the photocopied notes, the paperwork, the books, the rewrites and the endless forwarding to different university departments the same invoices and receipts in the endless quest for elusive conference funding, it still does. In fact, until reality set in, attending an overseas conference (or three) and presenting a paper seemed a very good idea in the lead up to handing in my doctorate. When I started to plot my abstract submissions, I felt like Persse McGarrigle, David Lodge’s fresh faced academic let loose from the University of Rummidge out on the conference adventure circuit. But it hasn’t at all been like something from his campus novels, Changing Places and Small World: An Academic Romance – shortlisted for the Booker Prize. I admit David Lodge – whose writing I adore, has ruined me utterly for life in the academic lane of the 21st century. Damn you, Lodge! Yet even he admits the times have changed. Sadly. I am now at that time of the doctorate (equivalent to being 8 months pregnant) when your friends are all sick and tired of hearing you complain how difficult it is. When the fear of the end (labour, or actually handing in the doctorate) looks like a blessing compared to the misery of being so uncomfortable. Swap swollen ankles for bloated expectations; nagging obstetricians complaining about weight gain for supervisors harping about the standard of your abstracts; and elaborate (and unrealistic) birth plans for equally unrealistic plans to present at not one but three overseas conferences. Surely I can’t be the only one deciding to present at three overseas conferences just 8 months out of handing in my doctorate? Please tell me there are others as driven, ambitious and mad as me? All I can say is that it seemed like a good idea at the time. The reality – like waddling around in the height of summer massively pregnant wishing you’d timed it for winter – is something else again. But just as exhausting. In order to complete the conference papers on top of my other work and family commitments, I have put in many, many all nighters – 10 hours at a stretch, (after coming home from work) for weeks on end. And it’s taking it’s toll. Just two weeks to go before I hop on a plane and everyone is saying “wow, you must be excited – three whole weeks to yourself, no kids, just doing the conference thing.” Alas, if I am exhausted now, drained and beyond feeling like I can ever possibly get my papers done to the exacting standard my supervisor demands, what will I be like when I finally manage to shuffle myself onto the plane and head to Utrecht? Will I be able to stand proud in front of my peers and my academic superiors? I am sure there is a term for this pre-conference malaise, though I don’t recall Persse McGarrigle suffering from it. Perhaps David Lodge, like the wise old women who neglect to tell you about the real pain of childbirth and the sleepless nights that follow, is omitting the worst bits not just to be kind, but to keep the faith. When it comes to overseas conferences, it’s not just doing the actual papers that cause the stress, but the ”administration”. Somehow organising the airfare, registration and accommodation, and then wrangling the money for it. I count myself very fortunate that I have had the support from my university and international conference funding, which will make the difference between being able to afford the trip or not. I am grateful – because from the experience of local conferences I have attended the past few years, I have discovered that David Lodge wasn’t lying when he wrote Small World and Changing Places – they are terrific ways to form networks, friendships, made valuable contacts, exchange ideas, and generally grow in confidence and understanding about your subject area. After two conferences in NSW and Queensland last year (again, thanks to my university for supplying some funding for me to attend and present papers), I made terrific contacts and now as a direct result, I spend one night a month discussing animal studies topics in a reading group with a professor I not only admire, but also have high up on my reading list. She has said she’d like to speak to me about my research next semester – from someone so in demand and busy, I am terribly flattered. So, later this month, I am off to Utrecht for the international Minding Animals conference and then off to the dreaming spires of Oxford University, where I will present papers on monsters and cyberspace in science fiction with Inter-Disciplinary.Net. But I am sitting here wondering if chasing the dream of Changing Places is worth it. Exhaustion factor is the main reason. However, old hands tell me that once I am on that plane, the laptop at my feet full of the much sweated over but completed conference papers, I will be able to zone out on inflight movies, red wine and sleep. This entry was posted in On Writing, Presenting, Your Career and tagged conferences, David Lodge, life family juggle, presenting, science fiction, self esteem, supervisors, Writing. Bookmark the permalink. 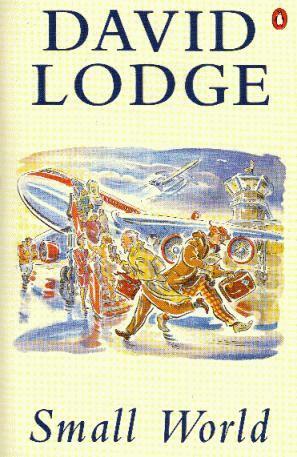 I’d forgotten about David Lodge – it’s so many years since I read and enjoyed his work. More recently I’ve enjoyed Alexander McCall Smith’s political machinations amongst the philologists at the Institute of Romance Philology in German – also written as a trilogy. Any parent who has primary responsibility for how the household runs (in most cases women) will know the challenges of trying to get a few weeks, or even a weekend, off. And if you couple of that with leaving behind a job and actually making the travel arrangements (as opposed to just getting on a flight organised an EA as my husband does) it is very stressful. But your conference travel will serve an additional purpose. As you enter that final 8 months of writing and finishing off your thesis you’ll do so with more clarity of thought and intellectual energy than you would if the next few weeks were spent doing the same routine over and over. Give your brain a break and with any luck it will reward you with brilliant insights and clarity of expression as you struggle to finish off your thesis. My experience in this? Not much, but I recently took a week off to attend a conference in my home city. I had been struggling for 2 months to work out how two different theoretical areas could be mapped onto each other. I had no sooner got on the bus into the city to attend the conference (leaving my laptop and all thoughts of my PhD behind) when the lightbulb went on and I had to madly scribble my thoughts into a notebook so I didn’t forget them. I’ve managed to organise a conference a month for five months, including one overseas and one in another state. On one level it seems nuts, but it is a good way to give me deadlines and encourage turning presentations into publications. It is also a way to get my message out there and network with a view to future employment. I’ve survived the first two, and have found them really helpful in consolidating where I fit and why my research matters. There is some initial stage fright, but I get excited about my topic and relax into the presentation. Having small audiences at the presentation has not diminished the impact – last year I presented to six people plus the others in the session, but had really wide coverage and quotes in articles because my uni’s media people had promoted the topic. The international conference I attended/presented at last month really surprised me with how limited and narrow the focus was, with my topic seeing really non-mainstream. This helped me realise that I have a mission to communicate what I’m finding. The conference I attended/presented at last weekend was fantastic for networking and might lead to employment (everything crossed). Try to relax once you are on the plane (don’t forget to email your presentation to yourself so you have a copy in case luggage is lost), and think of the experience as a gift to yourself, and your PhD. At least you are not eight months pregnant and should feel a bit more comfortable. I think that waiting to do the presentations afterwards might lead to them not being done, as you move on to other things. My supervisor says the best presentations at conferences are usually from post grad students. I have enjoyed both the David Lodge books and Alexander mcCall Smith’s but also love the Unseen University characters in Terry Prachett’s Discworld books. All the best for an enjoyable experience, and great professional recognition. I love Lodge’s description of conferences – not only in Small World, but also in How Far Can You Go?. Actually, my PhD includes the discussion of Small World. Actually, I think the hardest part of organising one’s conference trips is the accommodation-flight-travel part. I also have 2 conferences to do in September, and I have less than 8 months before submission, too. But I would disagree with 8 months pregnant analogy – my baby is 6 months old now, and I remember that being 8 months pregnant was the best time of my life. No work, no commitments, no swollen ankles – just a lot of time for myself, reading non-academic books, walking and horse riding… I wish it was the same now when I have to balance the PhD, paid work and a baby… Though it’s still not too bad. Evelyn, you remind me of myself – not that I’ve been to an overseas conference apart from crossing the Irish Channel, but certainly I’ve gone through the madness of trying to balance a full-time job with submitting a thesis on time, and then the madness of writing postdoc papers at a rate that even a full-time postdoc might find challenging, whilst continuing to hold down the full-time job. I nearly came unstuck this spring – I was smugly thinking how nicely I’d planned to get my book manuscript in on time AND a conference paper written, when suddenly I got asked by two different associates to give a talk to a local society AND a series of five lectures at a local university – and still I had the 9-5 to keep my feet on the ground. Nonetheless, my desperate drive to prove myself still ‘research-active’ has paid off – I am about to be seconded to be a part-time research assistant on a funded project for the next three years. Finally, I get to be research-active and funded – can’t be bad! As a mum of two small boys, PhD student and part time academic who has and just done data collection in rural Philippines I can really relate to this post! I also love the PhD like pregnancy idea – I feel like I’m in that blissful second trimester, no more morning sickness of the literature review and not yet the big bumpy burden of the thesis to write, just “making the baby” with the data, ‘pregnant enough” with some chapters for everyone to recognise that your a PhD student. I’ve been fortunate to have attended 3 international conferences in the last 12 months and off to Canada for conference in October. I always have of plans to ‘work on the plane’, but a movie and wine ends up being too tempting. As I said to the honeymooning couple next to me last time “I’m a mum and a PhD student, this is like a night out for me”. They looked at me like I had two heads and them promptly handed me one of the glasses of champagne that the air steward had given them… As for the mums with little babies doing PhDs, you are AMAZING! Honestly following a lot of days becmiong stressed. Finally I think okay just since I got rid of constant waiting. I were busy awaiting my boy friend to arrive here in Miami. This has been a busy week and that is why I am commenting late here. I wish to write a blog about my dating experience soon. How did you even find time to write this blog? I thought about being envious, but now I don’t know! I’ve been contemplating getting an Ed.D. and haven’t begun yet, but with two little guys running around, I am thinking of continuing to postpone. But, that still leaves me with having my every waking focus be on work (not me), children (not me), or my husband and home (not me). I am often frustrated as I’d like to have a little more “me” in my life. Can I guess you’d not recommend going for that advanced degree with a 1- and 4-year old still at home?! I enjoy your comparison of pursuing your degree to pregnancy and childbirth. As I finish the final few months of my masters degree, I can completely empathize! So many similar feelings. Thanks for sharing! It’s a shame you don’t have a donate buottn! I’d most certainly donate to this fantastic blog! I suppose for now i’ll settle for book-marking and adding your RSS feed to my Google account. I look forward to fresh updates and will talk about this blog with my Facebook group. Talk soon! Evelyn I think you’re absolutely doing the right thing – the pain will be worth it, much like childbirth I imagine 😉 I PhinisheD a few years ago now and wish I’d taken more of those opportunities to present and publish. I was so focused on the thesis that my ‘lack’ of academic outputs during those years has counted against me, at least in terms of securing an academic job now. Good luck!